Despite the surge in adoption of smartphones and media tablets over the past five years, until recently the projections of mobile commerce (m-commerce) growth had been overstated. But this past year appears to be an inflection point, with many people using their mobile devices for more advanced functions -- including digital commerce transactions. According to the latest market study by comScore, with m-commerce now accounting for about one out of every ten e-commerce dollars, it's time for retailers and marketers to start paying close attention to this platform shift -- so they can develop strategies to meet the evolving needs of their customers. comScore announced the availability of m-commerce sales estimates by product category occurring on both smartphones and tablets. This new capability aligns with comScore’s existing e-commerce sales estimates, enabling retailers, marketers, publishers and financial services companies to gain insight into the trends and market dynamics driving the emerging m-commerce sector. "Any channel shift has the potential to be disruptive to established revenue streams, and it would appear that m-commerce spending has reached enough of a critical mass that key stakeholders must begin to address this new market dynamic today or risk losing competitive advantage," said comScore chairman Gian Fulgoni. 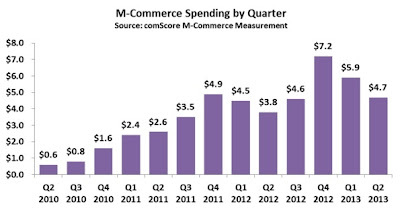 M-Commerce spending reached $4.7 billion in Q2 2013 with a growth rate of 24 percent versus a year ago. For the first half of the year m-commerce spending accounted for $10.6 billion -- that's representing 10 percent of the total digital commerce during that time. With the expected seasonal surge in Q4 spending, m-commerce could surpass $25 billion for the full year. M-Commerce spending for the first half of 2013 indicates that smartphones drove a considerably higher share (6.0 percent) of total digital commerce than tablets (3.5 percent). While smartphone users outnumber tablet users by a factor greater than 2x, the average spending per device owner is actually 20 percent higher on tablets. This is likely a function of the platform’s higher income demographics and its greater similarity to the desktop experience due to its larger screen size. The top-ranked product categories in total m-commerce sales for the first half of 2013 were Apparel & Accessories, Computer Hardware, and Event Tickets, while Video Games, Consoles & Accessories showed the highest percentage of digital commerce spending occurring via m-commerce (23.7 percent).